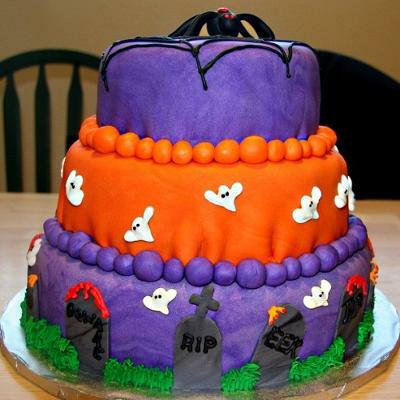 Cool three tiered cake for Halloween in festive purple, orange and black featuring a black spider as the cake topper. Cute ghosts fly around the center tier and spooky tombstones on the bottom tier. 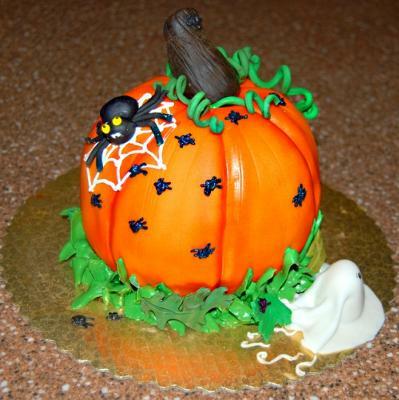 This would definitely be an eye catcher at any Halloween party...it's almost too cute to eat! We would like to thank Jan for allowing us the use of her photo, it is simply fabulous. 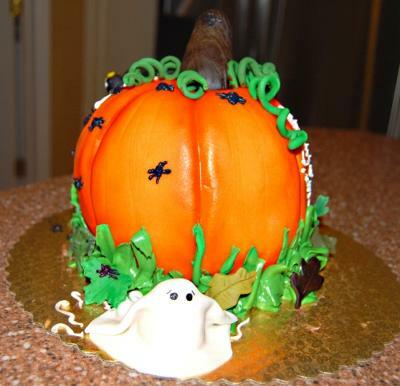 Look at this exquisite pumpkin shaped cake. 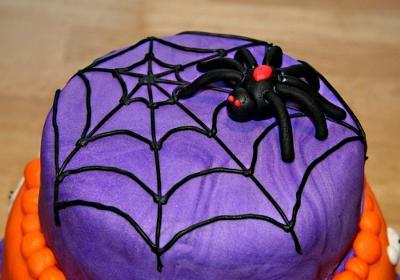 The fondant details on the stem and cute spiders, ghost, skeleton and on the pumpkin itself make this a really cool cake. It would make a beautiful centerpiece for a Halloween party. We want to thank Amy for allowing us the use of her cake photo. This cake was made by Amy at a class hosted by Pastries by Design. Need a super easy idea for a Halloween party? Or just something fun and yummy for the kids and you to do? These cupcakes are perfect!! Bake your cupcakes, cool and frost. Take the red icing gel and make squiggly lines from the center to the ends, just like pictured so it looks like bloodshot eyes. Pop a mini m&m candy inside the center of the gummy lifesaver. 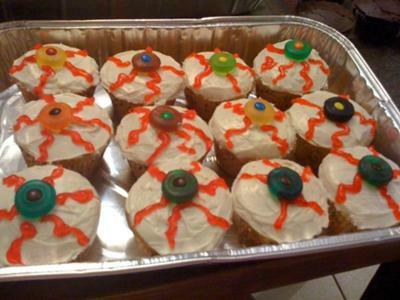 Place it in the center of the cupcake and there you have eyeball cupcakes. Halloween fun! 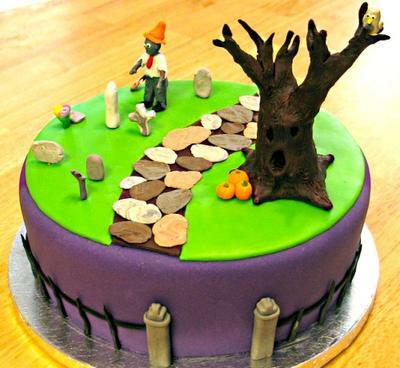 Make either a graveyard cake or cupcakes. Make a cake in any size pan- square or rectangular would be best but all up to your personal preference. Cool and frost. Use your black icing gel to write RIP on the cookies you choose as your gravestones. Place them in the cake in appropriate places. Place your ghost peeps behind them- you may want to use some frosting to stick them to the cookies if they don't hold. Take the sugar crystals or coconut (your preference, I use crystals because most kids I know do not eat coconut) and place them in a ziploc baggie- drop in a few drops of green food coloring- close it and shake it up to make the crystals green. Sprinkle it around the headstones as grass. Place your gummy worms, and you can use different items for other decor if you want. I used candy corns as a border for the bottom because I had them in the house- and found some pumpkin candies to throw on the "ground" too. Make your cupcakes- cool and frost. Crush your chocolate wafer cookies really fine. Use a food processor if you want- or just place in ziploc baggie and use a rolling pin. 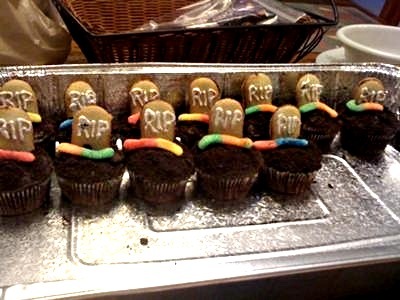 Place your headstones in the cupcake (make sure you write your RIP on them) and sprinkle the cookie all around the cupcake to look like dirt. Place your gummy worm and you're all done! 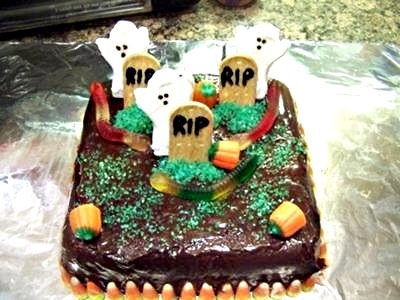 Look at the really cool Halloween themed cakes!! 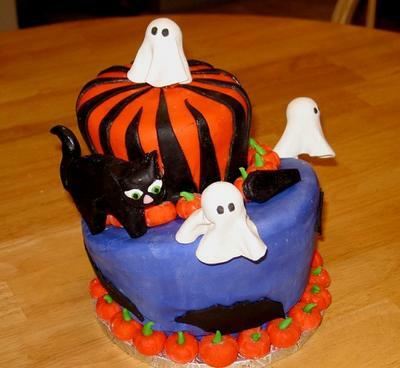 The first one is double layer cake with ghosts literally floating on the edges. Love the cute pumpkins surounding the bottom of each layer. 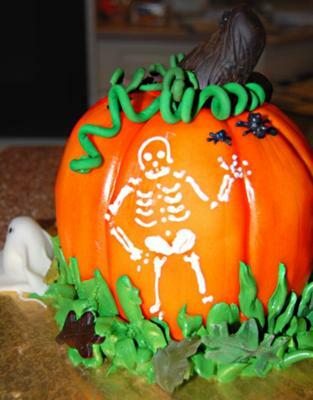 The second Halloween cake is a Red Velvet cake with cream cheese/white chocolate icing. The tree is modeling chocolate. All the other decorations are designed out of fondant or gumpaste.